Serbian band Kal serves a tasty dish of modern Roma (Gypsy) music, mixing traditional Balkan fiddles, accordion and brass music with rock, funk and infectious dance beats. It’s a style the band describes as rock’n’roma. Kal hails from the suburbs of Belgrade and is led by guitarist, vocalist and composer Dragan Ristic along with Miloš Veličković on drums, Ivan Kuzev on bass, virtuoso musician Dejan Jovanović on accordion, and Milorad Jevremović on violin.The group is joined by a large cast of guests on the album. Kal is one of the finest Romani bands from the Balkan region. 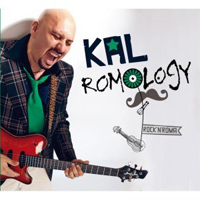 On Romology Kal showcases impressive acoustic interplay mixed with modern urban rhythms. Definitely a band to watch.